Florida may be known as the Sunshine State, but with Halloween quickly approaching its sunshine is often obscured by the encroaching scene of haunted houses. These deep, dark, scary places crop up each year, ready to scare the daylights out of all who dare enter. Face it: It’s just not Halloween in Florida without a trip to at least one spook-filled haunted house, even if it means missing a good night’s sleep. These 10 best haunted houses in Florida are sure to put you in the Halloween spirit—enter at your own risk! It will be hard to convince your mind that it’s all fun and games, that it’s not real blood splattered throughout or that the props and actors can’t harm you. You can take your pick of journeying through an infectious disease-laden labyrinth, taking your chances against the madness of hardened criminals, finding your way out of the dark woods before you become the Tate family’s next victim, or a variety of other haunted attractions sure to send you home screaming. Once you begin your journey through the haunted maze, take care to ensure you don’t take a wrong turn. If you do, you might be trapped forever! Along the way, you may encounter your share of spooky creatures, some real and some animatronic. But you might not be able to tell the difference until it’s too late. If you make it out alive, you’re one of the lucky ones. This truly horrific haunted house will either have you screaming to get out or screaming for more. Here it’s a battle of wits: did something really just brush up against you or did you imagine it? Do ghosts exist or is your mind playing tricks? It could have you questioning everything you thought you knew about reality, pushing you just far enough to force your mind out of your body. As if you needed another reason to visit a brewery, you’ll want to check out the haunted Anheuser-Busch brewery in Jacksonville. You’ll be a hero when you clear the brewery of zombies in a live action zombie hunt. Once you’ve tackled the walking dead army, you’re free to enjoy the haunted putt and crawl, zombie paintball, crazy clown carnival, and the Art Garden of Death. 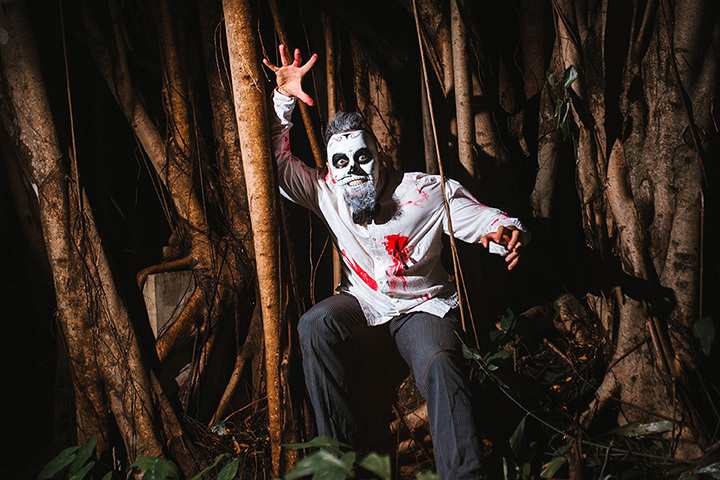 This haunted carnival is the largest in South Florida, delivering a one-of-a-kind terrifying experience to all who enter. The 3D experience brings all your secret fears to life, sending chills down your spine and setting your heart into overdrive as you face your deepest frights. Chock full of carnival rides, odditorium, stunt show and haunted experiences, you may be sacrificing more than one good night’s sleep after your visit. If you love the hair-raising, spine-tingling feeling of pure terror, you won’t want to miss Enigma Haunt. The three haunted attractions here will bring your every fear to life. The spooks here play on the area’s heritage and real-life ghosts, making your experience a little too lifelike and may have you rethinking your belief in ghosts. The forest may look like a normal part of Mother Nature, but the secrets within may have you regretting your journey through it. All through the trees are whispers from lives of a bygone era, pushing you closer and closer to a massive haunted house. You may think you can take refuge here, but rest assured that this is no safe haven. Spirits roam free, monsters lurk in every dark corner, and sheer terror awaits unsuspecting victims who are brave enough to enter. This nautical-based haunted house is the only one of its kind. Set aboard the docked American Victory Ship, you have fewer places to run and hide when the ghouls and ghosts come out to greet you. It’s a full sensory experience from start to finish. Beware the corners though—you never know what’s lurking about! Face the Fear is taking coulrophobia to new extremes. You’ll be surrounded by smiling, bright-eyed, funny faced clowns, but don’t let their outward appearances fool you. You never know what’s lurking beneath the paint, and they might be smiling because they’re looking forward to their next victim—will it be YOU? Not all haunted attractions have to keep you up at night. The Haunted Angelus House is perfect family friend fun for those of all ages looking for a fright night. The 20-acre park is the world’s largest fully handicap accessible haunted attraction, putting guests of all ages and abilities in the Halloween spirit. If you’ve got the little ones in tow, stick with the haunted hayride—the haunted house might keep them awake for days!